This is a transcript of a letter which was originally written by LRO(G) Royston Williams wifes Great Great Great Great Grandfather who was a Master in the Royal Navy. His name was Richard Anderson and he was the Master of HMS Prince at the Battle of Trafalgar. The original description is held in a Museum at Birmingham UK. Thanks Royston for the transcript. Dear Sir, I have just time to write a few lines so shall begin immediately with the morning of the 21st October. At daylight we saw the enemy to leeward 10 miles and about 10 miles from the shore between Cape Trafalgar and Cadiz: we have 26 sail of the line and 2 frigates, the enemy 33 sail of the line and 7 frigates. They immediately formed a close line of battle and waited for us; our Fleet was sailing in two lines, Nelson leading one; Collingwood in ‘The Royal Sovereign’ leading the lee line. The Britania, Prince and Dreadnought were to the windward consequently the furtherest from the enemy and little wind. We did not get into action until the latter part so had a complete view of the attack, however, when we did go down we totally dismasted our opponent with two broadsides and set him on fire, which prevented him doing any more and saves us of course. She was called ‘La Achille’ of 80 guns and 800 men, had 42 pounders on her lower deck. We have our masts and bowsprit wounded, sails and rigging also; we saved 145 poor seaman and soldiers with our boats after she blew up and a cutter saved 150 more out of the 800. It was a most horrid sight and could be seen to see the poor fellows flying in the elements. I have got great credit to placing the ship in the manner I did and for getting us clear again of the ship on fire which we blew up. Captain Grindell has publically thanked me in the presence of the officers on the quarterdeck for my conduct in getting clear of the ship on fire. The action began ten minutes past twelve, our ships went down in 2 lines ahead; Admiral Collingwood broke their centre in ‘The Royal Sovereign’ and to the ‘St Anna’ of 120 guns, he behaved nobly. Nelson attacked the French Admiral and ran on board of him; poor fellow; he was killed from atop of the French ship by a musket ball. All the van of the enemy by that means was unoccupied, we all coming down in the rear brought such amazing force in the centre and rear which completely dished the enemy and before the van doubled to support their centre we had taken at least 10 sail and we had 7 sail of the rear of our vanguard which had not been in the action, so they went between the enemy’s van and our centre which cut them totally off and they ran away. We went down the rear of their ships and smartly engaged as we passed. Seeing a ship of our force two immediately struck to us and afterwards we bore upon another; after giving her broadside she struck her colours. After we had gone with her we went down the van and seeing another ship engaged we at length got alongside her; I was determined to have another dash at the French Flag. We fired a whole broadside into her and in ten minutes she was in a complete blaze with a tremendous explosion and every poor fellow went. We then went to take possession of the prizes; We took possession of ‘The St Trinadada of 130 guns on 4 decks. She had an Admiral on board, wounded and 500 killed. His name is Don Digo Baltasar Althadisharo; 19 ships had struck and several burnt and blown up, the rest went to Cadiz. We had ‘The Royal Sovereign’ ‘Buillule’ totally dismasted (and 11 prizes dismasted). We took the 4 decker in tow and at night it came on a most tremendous gale of wind which broke all our ropes and drove us near Cadiz. the most dreadful gale I have ever experiencied. I never was so anxious in my life to save this great ship to England. I had everything I wished from my Captain. At last I went on board her again and found she would founder so took all the poor prisoners out of her except 23 which to remove. would have died, and the gale of wind coming on I kept her up 48 hours, and the leak increasing was obliged to sink her, with the 23 poor fellows in her. It was a hard case to see them go down and what was to be done. We have more prisoners on board than English and only 40 tons of water, have just heard that after the gale, that Admiral Collingwood has ordered all prizes to be burnt or sunk; thank God I am well, excuse haste a frigate going to England. Signed Richard Anderson. Richard Anderson was a Master in the Royal Navy. He died on 5 December 1835 aged 61. 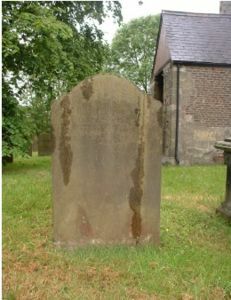 His wife Mary (nee Eggleston) died on 24 December 1833 aged 55. Richard was born in 1774 on a farm near Kilham on the Yorkshire Wolds, the sixth son and seventh child of Robert Anderson and his wife, Elizabeth Robson. He was baptised at Kilham All Saints on 13 March 1774. Richard and the two brothers who followed him, Christopher and Robert, wanted to go to sea. With an uncle, Edward Anderson, and his eldest brother, Thomas, both being ship owners in Hull it wasn’t such a strange ambition for a farmer’s son. He duly went to sea and was coerced into the Royal Navy. Richard has become a family hero and it is difficult to sort out the myths from the facts. What is certain is that on 8 May 1785, aged 21, he was made a Ship’s Master only two years after he was impressed. Richard’s father, Robert, died in 1796  but brother John was happy to remain with their mother and run the farm. On 13 February 1805 he was posted to HMS Prince,  captained by Richard Grindall. 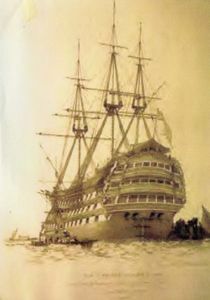 Prince was a heavy lumbering ship which was described by some wit as “sailing like a hay stack”. Prince was sent to join the blockade of the Franco-Spanish Navy in the summer of 1805. Richard’s diary is full of little bits of interesting information but gives a feeling of boredom rather than anticipation. Eventually Richard left the navy and settled back in Kilham to raise a family. His first child, Richard Eggleston Anderson, was born in 1816, followed quickly by Edward, William and Mary. His affairs were attended to by his brother, David. His goods and chattels were valued at £283 but there was also his house in Kilham and the house in Hull which had been left to him by uncle Edward in 1806. I‘ve been very interested in naval history of around this period, and was fascinated to read Richard‘s report. Thank you so much for sharing it with us.